Hi all. It’s that time of year again when everybody starts frantically looking for awesome turkey recipes and the best cooking methods online. 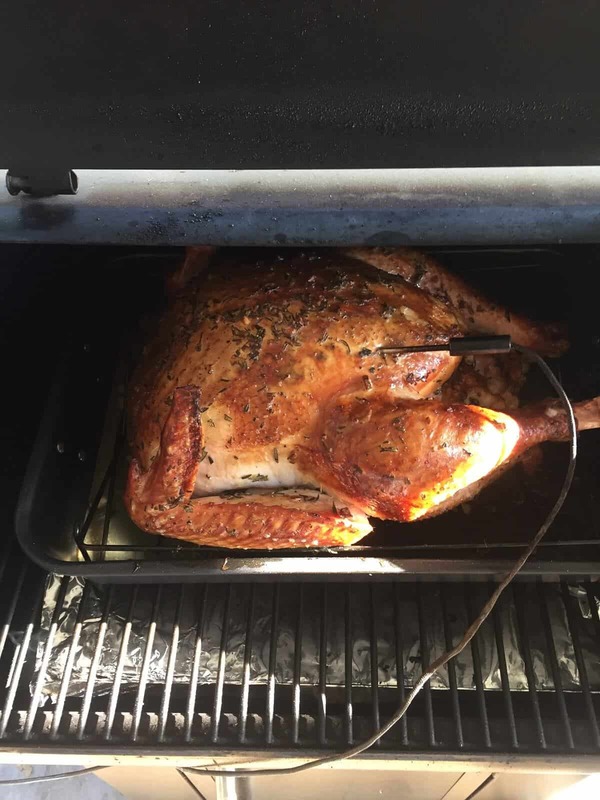 Why not try something different this time around and use your Traeger to slow smoke your Thanksgiving Turkey. 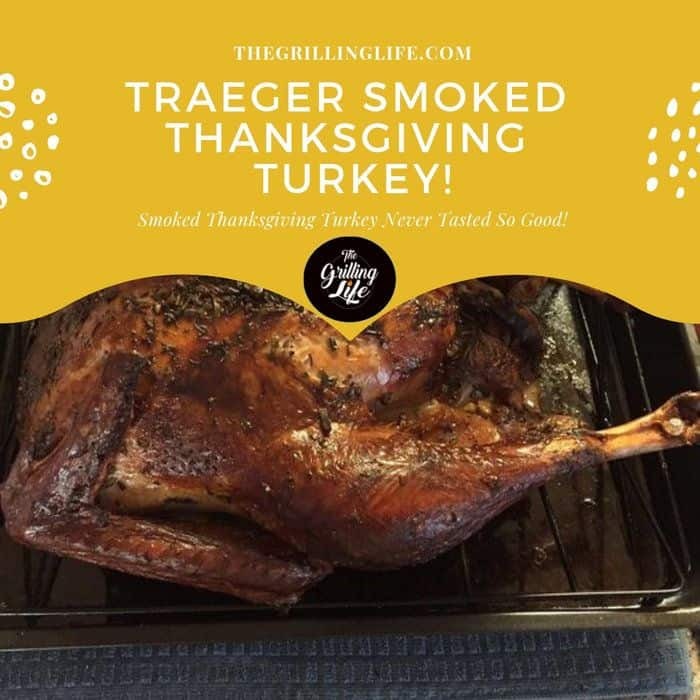 Traeger Smoked Thanksgiving Turkey is one of my family’s favorites so I wanted to share with you my tips and tricks to make your Thanksgiving feast simple yet unforgettable. If you’re like my family and I and love the flavor of a smoked Thanksgiving turkey, or have always wanted to try it, then read on. There is something here for both the beginner and experienced cook and I promise you, it is easier than you think. 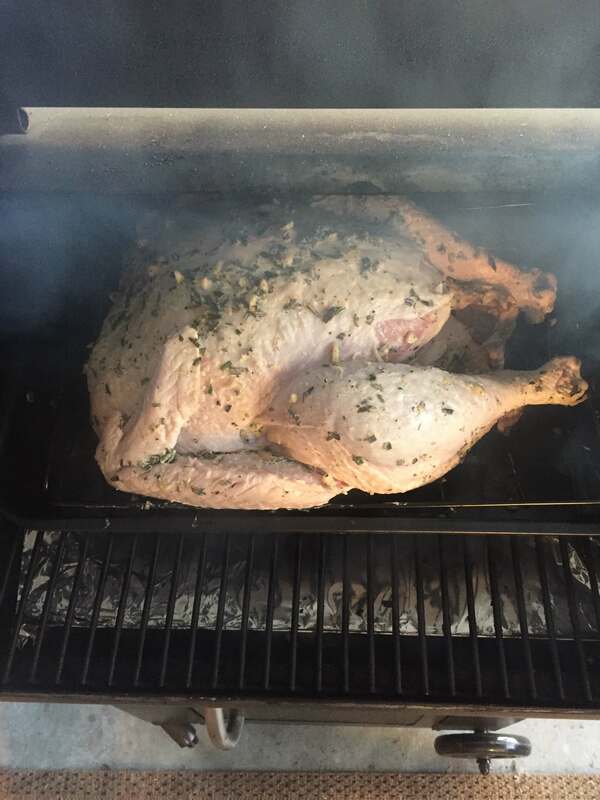 A Turkey is one of the easier things to smoke in my humble opinion and it is FANTASTIC! Not only does slow smoking your turkey keep the meat super juicy, but it also infuses that awesome smoky hardwood flavor by using your favorite variety of wood pellet. Another great thing about cooking your Turkey outdoors is that it frees up your oven for all the other mouthwatering side creations your family and friends expect. Perhaps the only downside is that your house will not have that heavenly roasted turkey smell until you bring it in the house. But don’t worry, it will definitely make up for lost time. We actually didn’t even host at our house last year as we were invited to a family members house. We were informed that they would be serving a honey baked ham with all the trimmings. Ok, I could deal with that I guess, although I was feeling a little bummed that I wouldn’t be able to smoke a turkey that year. I really enjoy smoking a full turkey and the flavor can be amazing but it’s something I mostly only do once a year for Thanksgiving. I am always meaning to do it more throughout the year, but after the leftover turkey burnout from the holiday, it always slips off my radar. So while I was feeling down and making a promise to myself that I would definitely smoke a turkey the following month to make up for it, we received a call from the hosts. They asked if I would mind smoking a turkey and bringing it when we came. They said they know how much everyone loved my turkeys in the past and it would be great to have it to go along with the ham. While trying not to let on to my sudden excitement, I replied as casually as I could, “sure, I guess I can do that”. And so it was on! I started planning right away, making sure my equipment was ready, deciding on my recipe and gathering all the ingredients. Thankfully, there was still time for a dry brine. Oh, did I forget to mention brining? Well, let me fill you in on a little secret. The absolute best way to smoke a turkey is to brine it first. If you don’t know what brining is, you can check out this article, How To Brine Meat – An Intro And Guide To Brining. The following smoked turkey recipe starts out with a super simple dry brining process. My preferred method is a dry brine, but whether you use choose the dry or wet method, I highly recommend adding this step. A dry brine will help you skip the hassle and mess of a wet brine. Why deal with the messy water version when dry brining is just as effective if not more so in my opinion. Dry brining is not only easier, it also produces better flavor because the natural juices aren’t diluted or replaced by the water. Instead of soaking up all the extra water when you wet brine, a dry brine tenderizes and helps preserve the turkey’s juices without watering down the flavor. Here are two helpful articles on the subject to help you decide and get you going. Once you’ve gotten your brine on, it’s time to work on the turkey recipe. 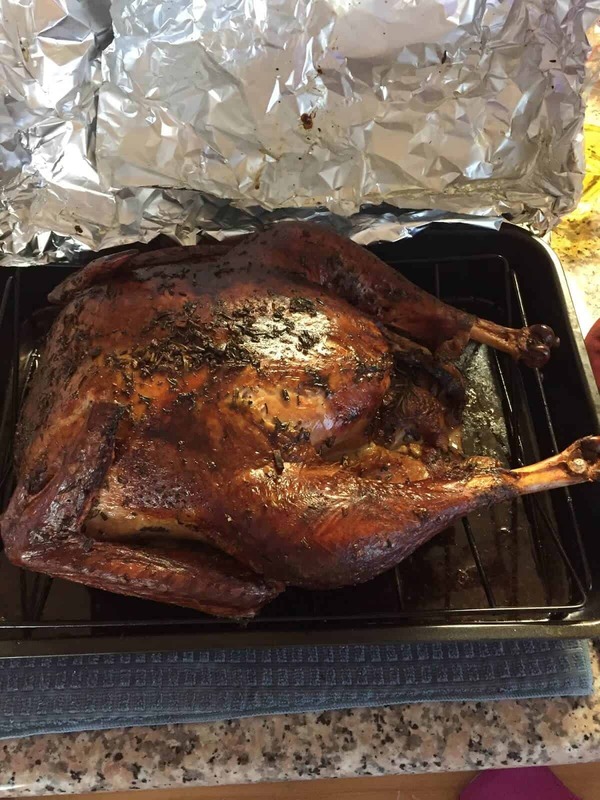 I started with a beautifully fresh and unfrozen organic 15-pound turkey and boy was I lucky to get it. As I said, it was pretty last minute (the day before Thanksgiving) and it was the last one left at that size that was not frozen. I decided to go with a simple, tried and true recipe this year because of the time frame I had to work with. This not to say that it is a bad recipe because it is still one of my favorites, but I usually like to experiment and try new ideas. I went with a rosemary, lemon, and garlic seasoning that I have used many times before on whole chickens and turkeys. A quick rundown of the recipe is below. Start by removing the giblets and rinsing the turkey inside and out. Pat it dry with paper towels. Load up the turkey’s belly with the rosemary sprigs, thyme sprigs, cut lemons, peeled garlic cloves and onion chunks. You then mix the remaining ingredients into a mixing bowl and smash it together well into the butter. Rub and massage the bird from top to bottom with the butter mix, taking care to coat every inch of skin to make sure every bite is loaded with flavor. I try and rub as much as I can under the skin as well, but that is not really necessary. The flavor will still get in. I also sprinkle extra rosemary over the outside of the bird for extra flavor. Next, fill your roasting pan with the chicken broth, and you’re ready to go. I decided to use the Traeger pellet grill this year instead of my Big Green Egg porcelain smoker. The main reason being that I had to start smoking the bird at 5 am due to an early dinner start time and the Traeger is a very easy to use option compared to charcoal smoking. You can literally set your desired temperature on the Traeger, insert a wireless meat probe with automatic alerts and go back to bed if you wanted to. Into the Traeger, our bird went with the setting on smoke for the first 3 hours. 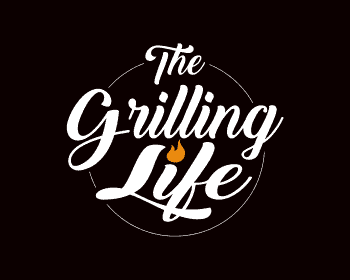 Give that bird and good long smoke, letting the grill do all the work while you get busy on other things. When three hours were up, I moved the temperature to the 350°F setting and let her cook until she reached a 165°F internal temperature. This took close to another 4 hours for the turkey to reach the proper and safe temperature. I basted the bird about once every hour during this later part. Since the turkey is always the center of attention for every Thanksgiving meal, ensure that the meat is cooked perfectly by using a wireless meat probe and instant read thermometer. I can’t even begin to tell you how much simpler your life will be using a good wireless remote meat thermometer for long cooks. I have reviewed several great remote temperature probe options you can read about here: The10 Best Digital Probe Meat Thermometers. Finally, I wrapped the whole roasting pan, bird and all in tin foil and then wrapped it again in towels for the ride to our family’s. If you’re not transporting the bird, let it rest uncovered for 10-20minutes before carving. Covering it up with tin foil will make the skin less crisp. 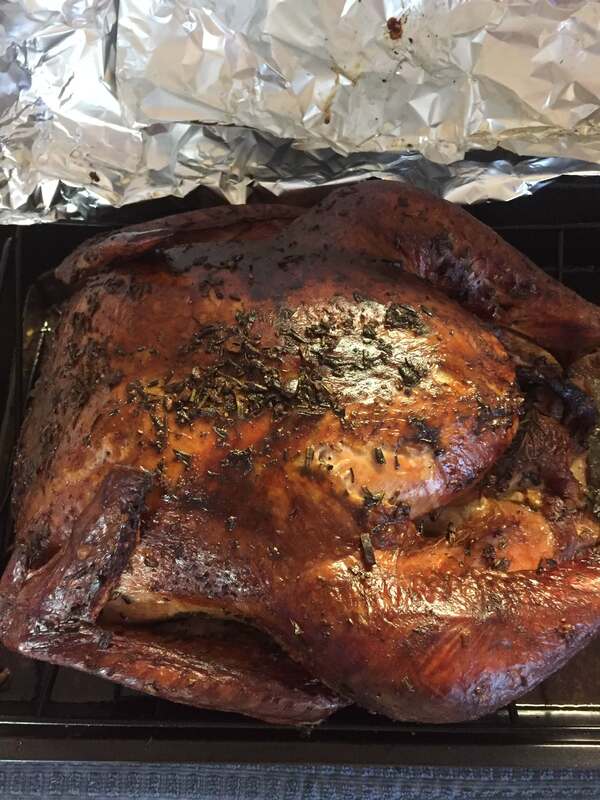 I am happy to say that the Traeger smoked Thanksgiving turkey was a success. It was moist and dripping with juices. It had a nice and mild smoky flavor that went very well with the rosemary, lemon, and garlic recipe. And much to my delight and disappointment, there were no turkey leftovers to take home. I hope you have enjoyed my Thanksgiving turkey story and that you have a great Thanksgiving with your loved ones as well. If you try this recipe or have one of your own to share, we would love to hear about it in the comments below. If this was helpful to you, please consider sharing with your friends or on social media. Sharing is caring my friends!